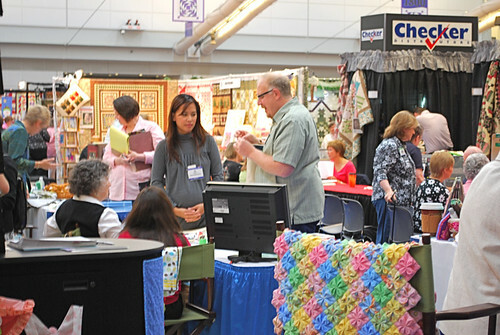 More Quilt Market thrills - Stop staring and start sewing! I was heading somewhere fast when out of the corner of my eye I saw this...Mark Lipinski! So I got a quick picture. Check out the gal next to him. I seriously think she has no idea who she's standing next to or she'd look a lot more excited than this. Don't you think? 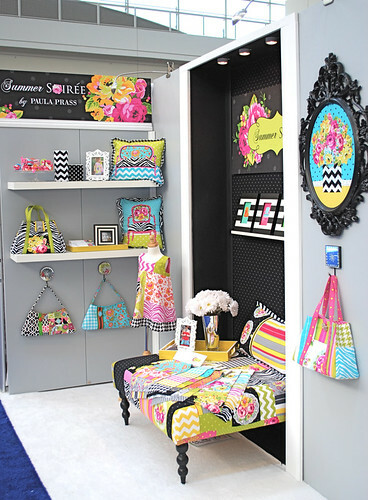 Okay, I've been waiting to show you these booths because they are soooo colorful and amazing (and they belong to some of my favoritest fabricky people ever!) I didn't want them lost in the mix. 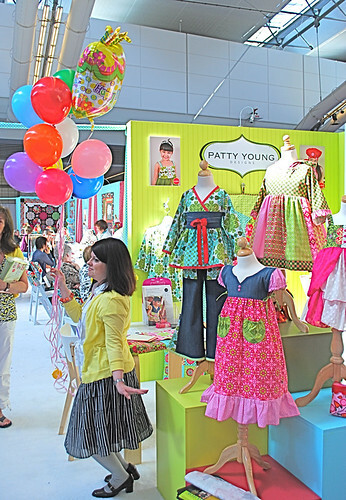 Here is Paula's booth and isn't it stunning??! 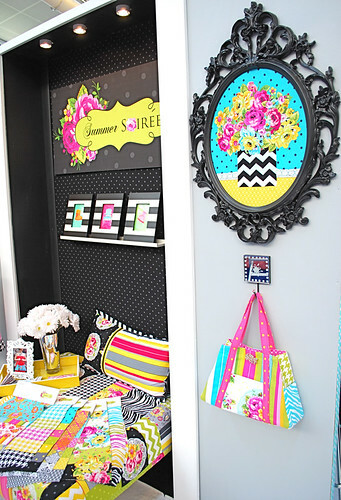 Her next line, Summer Soiree, just thrills me because it's pretty and colorful and the black and white fabrics just knock it out of the ballpark. 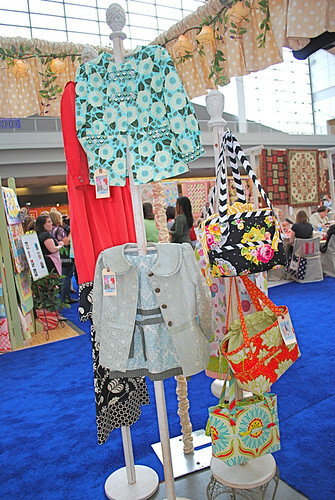 Those stunning bags were made by Simone Howell (check out her flickr page if you want your socks knocked off). I knew Simone was going to be there so I just looked around for a great purse until I saw one that looked like her style. I walked up, checked the name tag and sure enough, it was her! She was part of our Thursday night dinner group so it was nice to spend a little time chatting with her. I want that on my wall!! 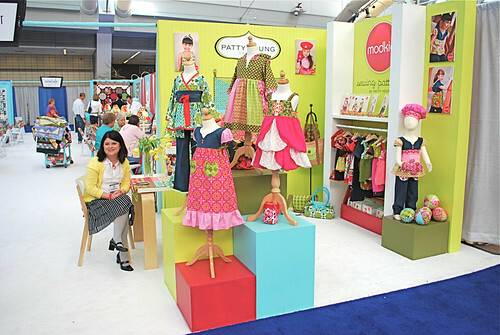 Okay, here is Patty's booth and it was soooo cute! I love the colors! She and Jon had a bit of a disaster after building it (go read it on her blog and weep) but they put it back together and here it is! Here is Patty (taken zillions of orders for patterns I'm sure!). Here's Jon hiding behind the display. He's got that intimidating Fu Manchu look going on here but believe me, he's harmless. On Friday we surprised Patty with some birthday balloons and a very loud rendition of Happy Birthday to You. I took her card all over the floor and managed to get some great signatures on it...."Um....Mr. Fassett...um, well..my friend Patty...well she's a super famous designer and...well...it's her birthday today and...um...could you sign her card...maybe? Yes? Yes?! Ssssscore!" 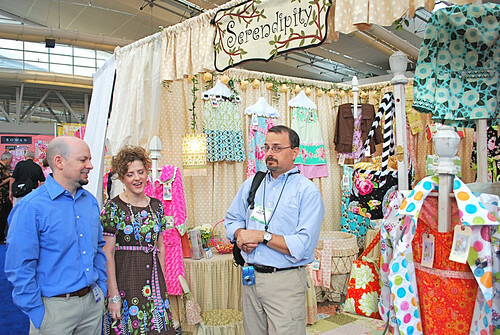 Okay, Joey spent a lot of time over at the Sew Seredipity booth because we simply adore Keith and Kay. Keith works with the same obscure radio system that Joey does so they're always like "radios...blah, blah, blah....radios....blah blah blah". So Kay and I ignore them because we're all like "fabric....blah blah blah.....fabric....blah blah blah". So that's why we like them. Here are some of her new designs. 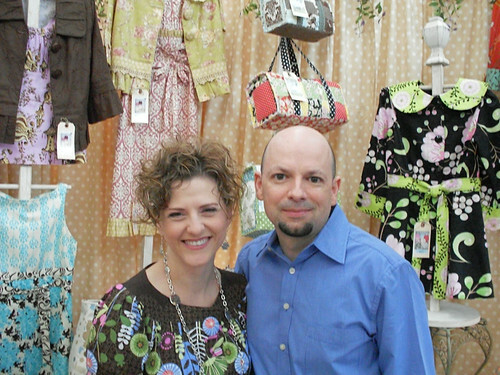 Yep, they're coming to Fabritopia. Oh man, that red coat!! The ruffles are silk and it was simply stunning! Here they are! Oh, and check this out! 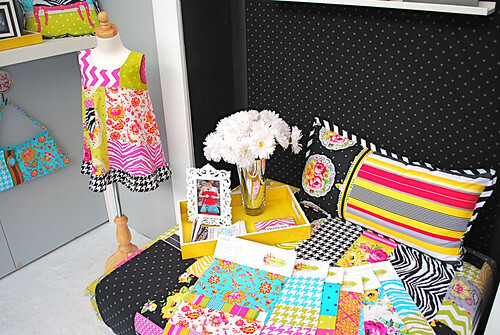 Kay has a deal with McCall's Patterns (sweet!) 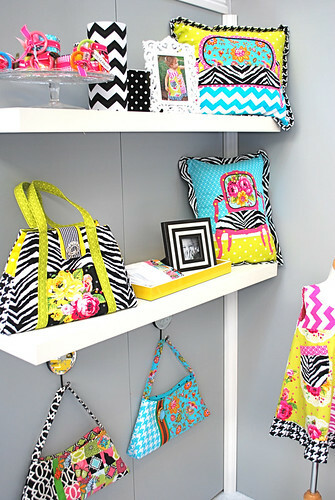 so you can pick up some of her patterns at your local store too! 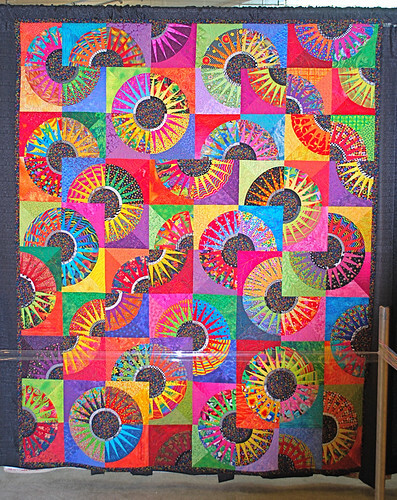 Here is an amazing quilt called The Beauty of Pensacola by Judy Holley. Amazing detail. This jacket was pretty amazing. 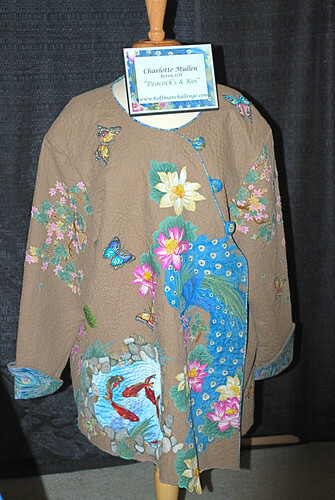 It has a koi pond on the left (when you're looking at it, not wearing it) and a peacock on the right. Wow! 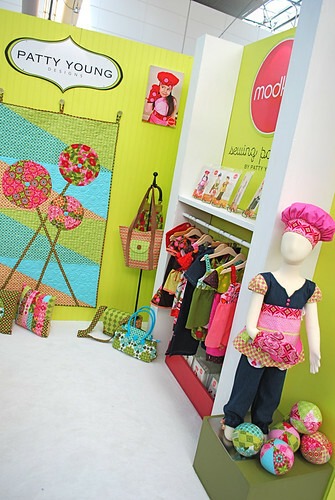 The winner of yesterday's Moda box is Stephanie (yes, you Stephanie S.!) who said "okay, I would LOVE to know where to find those buttons! I'm a sucker for buttons like that....what? you're going to sell them in your shop?! you rock :) seriously, will you sell them in your shop? pretty please (insert cheezy grin) :)" LOL!! Stephanie cracks me up. Alrighty, here's todays awesome market give-away! 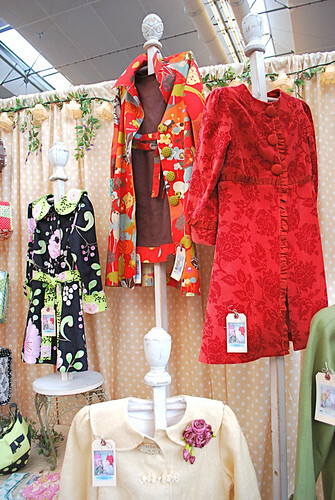 The Moda home booth is great and they have some terrific things for kids like paper dolls and lace up sewing cards with vintage designs on them. So here you go! 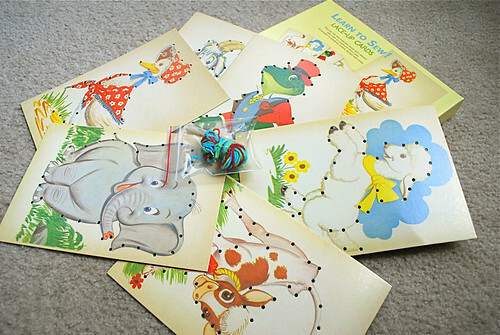 A box of "Learn to Sew" lace up cards by Moda for your favorite little "wannabe sewist". Leave a comment and cross your fingers (or make the sign of the cross and say a prayer...whatever you think you need to do to increase your chances!). Grand finale tomorrow! Thanks for hanging out with me!